Fall is officially here…I didn’t need a calendar to start dictating my wardrobe as it’s been cool here for a few weeks, but now there’s no stopping the sweaters and tights and boots and all of the fun fashion associated with fall. Blame my Catholic school upbringing, but I associate my J.Crew plaid cafe capris with fall, and was excited to pull them out for the first time this season. I went on another double bling binge this morning…Tilda + Crystal floral statement necklace. AND my new 3.1 Philip Lim for Target tote. I’ll be honest, I caved to all of the online and Instagram hype with this…but I’m glad I did. My store didn’t sell out immediately so when I made my Sunday Target run, I figured bags left on the shelf meant I needed to have one (oh, the justifications…) But, like I said, I’m glad I caved. The color is a nice grey/taupe neutral and the shape is not something I already own. I think it’s a nice alternative to the much more expensive Pashli tote that is not in my bag budget at the moment. 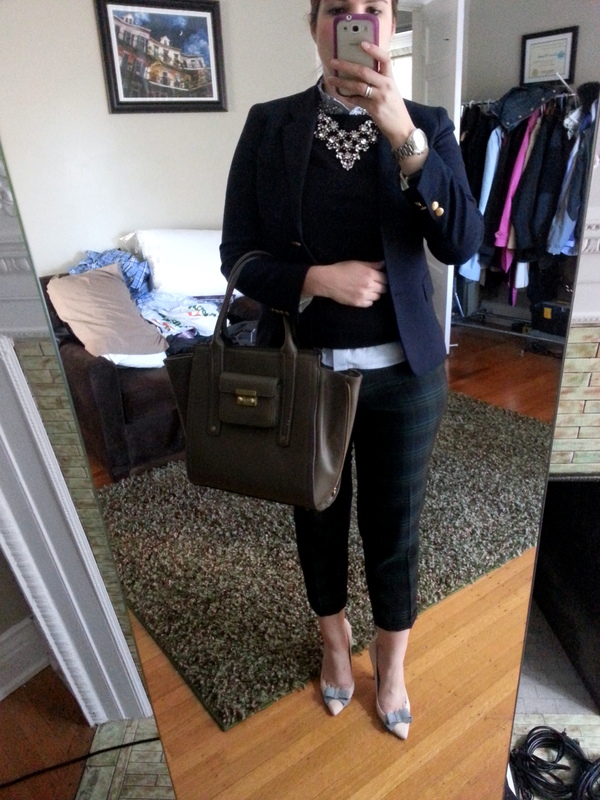 This outfit made me feel buttoned up and put together – but still with some of my sparkly element. A smart blazer always pulls an outfit together in my opinion. And in this case, the bag really pulled this outfit together as well! I’m glad I came back for a second round of pictures after work that included the bag. And even after 9 years of plaid jumpers and skirts…I still rock the plaid now and then 🙂 So how about you – are you ready for fall? What are some of the items you’re excited about pulling out? Would love to hear what you think and thanks for visiting! I didn’t succumb to the Phillip Lim at Target hype, but the more I see the taupe version of that bag, the more I kind of wish I could find one (though I just got a taupe tote …) It goes well with your outfit, plus it’s in that price range that if something were to happen to that bag, there wouldn’t be too much heartburn over it!